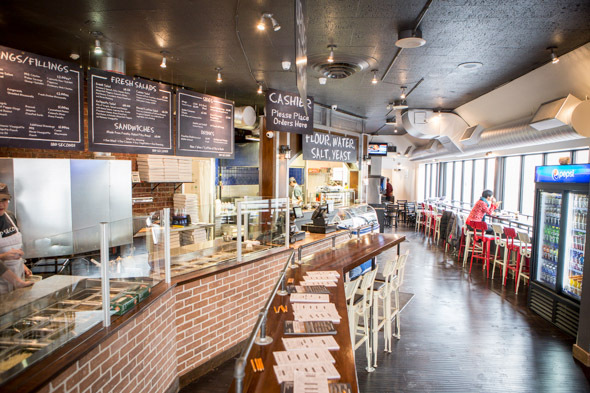 180 Secondi opened earlier this month at Yonge and St. Clair right beside Union Social Eatery . Claiming to be the first of its kind in Canada, this casual, assembly-line style resto's main gimmick is that it can cook a customizable, artisanal pizza in about three minutes - hence, "180 secondi" (that's "seconds," for you non-Italian-speakers out there). 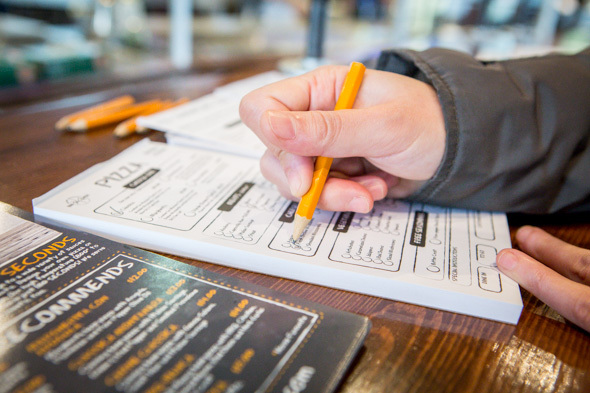 To order, patrons fill out one of the paper-pad forms to specify their preferences - choose one of the five bases, add extra toppings for $1-$2 each - and then the pizza-maker gets to work. All pies come in one size only, approximately 12 inches in diameter and cut into six slices. 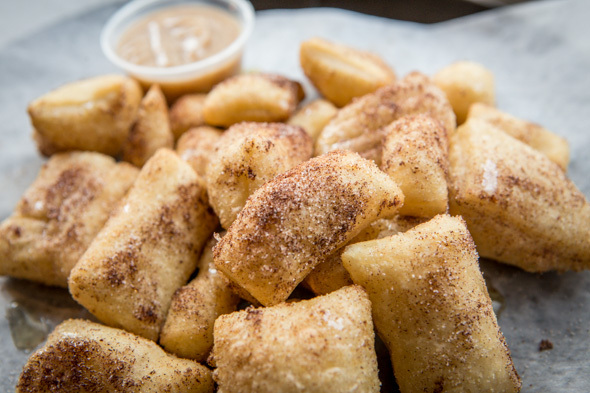 One is enough for two people who aren't too hungry. 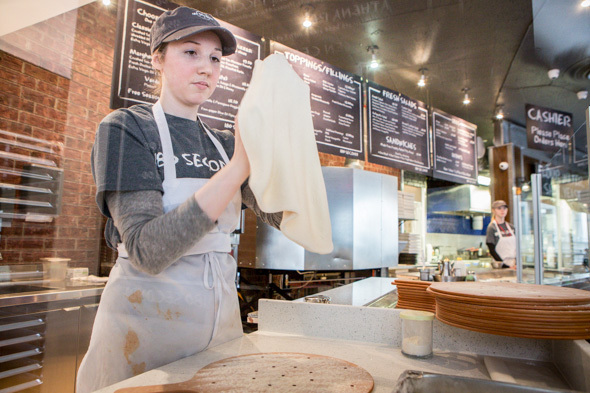 The dough, like most everything else here, is made in-house with natural ingredients (flour, water, salt and yeast, as the chalk-like writing on the board states) and then left to mature for three days. Funnily enough, the extra-fine Antimo Caputo flour used is ground from Canadian wheat imported to Italy, so it's now come full circle. 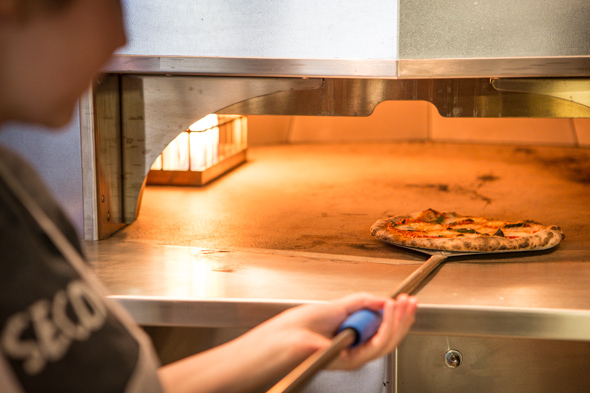 When a pizza order comes in, the dough is hand tossed and stretched, the specified ingredients are added and then it goes into a stone-hearth oven that reaches temperatures between 800 and 1,200 Fahrenheit. Not every pizza is the same, so they're not always ready in exactly three minutes; timing ranges from around 120 to 180 seconds, and its readiness is judged by experienced eyes instead of a timer. The aim is to have the perfect amount of char: 10% on the top and 20% on the bottom. Described as "neo-Neapolitan" pizzas, they're kind of a cross between what you'd eat in Naples (minimal, high-quality, fresh ingredients) and what you'd find in New York (thin, crisp-on-the-outside, chewy-on-the-inside crust). 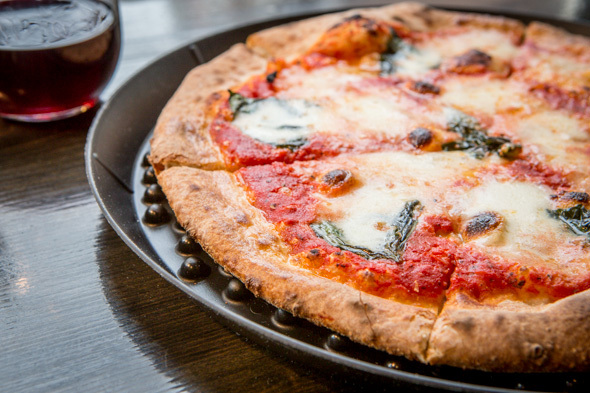 We try the Margherita ($11), one of the most basic pizzas. 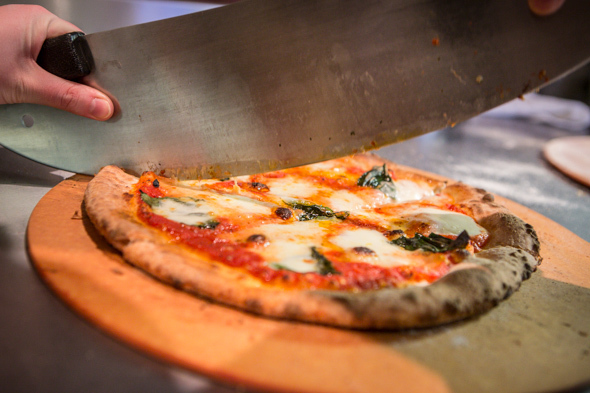 It's quite textbook: crushed San Marzano tomato sauce, fresh Ovoline mozzarella, some basil, EVOO and sea salt. Simple and satisfying. The crust is almost eerily light, and is served on a cheesily-named tray called a Pizza Pleezer, covered in small bumps to allow it to cool efficiently and prevent soggy bottom-ness. 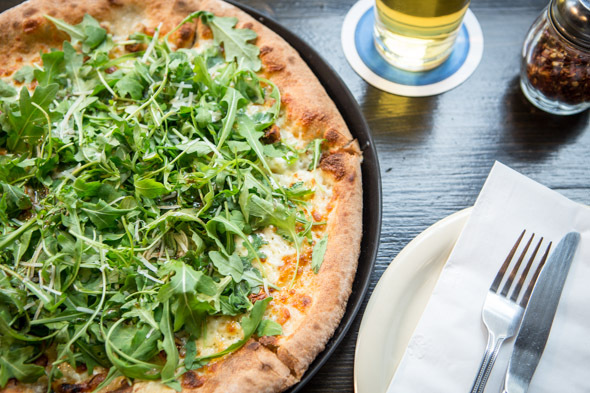 Another highlight is one of the special "craftsmen" recommendations, the North Beach Bianca ($14). It's a white-base pizza topped with gorgonzola, figs, arugula, freshly grated parmesan and a drizzling of balsamic vinaigrette. The savoury, sweet, bitter and acidic flavours balance each other nicely, making for an unexpectedly winning combo of ingredients. There are also non-pizza items, like made-to-order salads, sandwiches and sides. 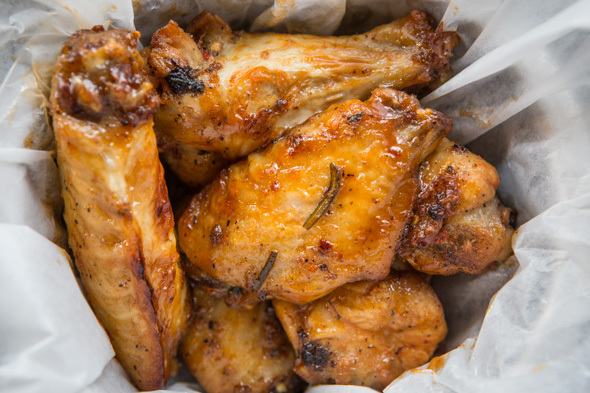 Wings ($7/half-dozen, $12/dozen) come in a rosemary-herb marinade and a variety of different sauces like honey-garlic and suicide. For dessert, options include various gelato and sorbet flavours ($4/small, $6/large) from La Vizziata in the Junction , as well as jumbo cinnamon sticks ($5) made from the same dough as the pizzas, drizzled in honey and served with a cinnamon butter dipping sauce. 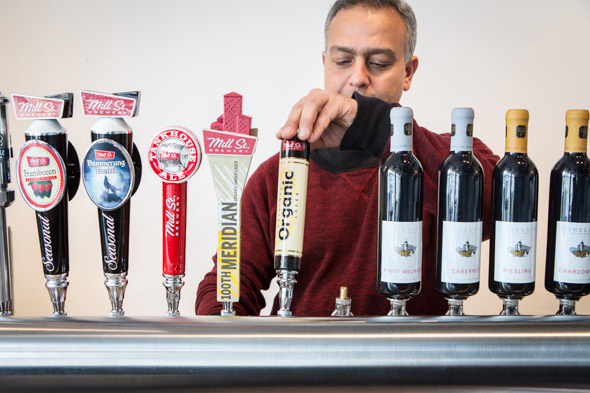 In addition to fountain and bottled soft drinks, there's a beer, wine and coffee bar in the back with craft brews and wines all on tap. Beers ($4/12 oz., $6.50/20 oz.) include Steam Whistle and a variety of Mill Street brews while a selection of kegged red and whites from Vineland Estates Winery ($6.50/5 oz.) are also available. For now, there is no delivery - patrons can dine in one of the 59 seats (plus 10 when there's an outdoor patio) or get take out. The plan is to have people come in and see the open kitchen and experience how everything works for themselves before an online delivery service launches in the near future. So far, the place has been popular with nearby office workers looking for new lunch spots, and is catching on with those who live in the area. This is a smart franchise template that could definitely prove to be successful - what's not to like about fast food done well?